Join us for our FSU Visiting Artist Lecture showcasing Sarah Black. This event will take place on Thursday, March 19th at 7PM at the Fine Arts Building (FAB), RM 249. Sara has worked broadly as an artist, artist-teacher, arts organizer and curator. In 2005 Sara was a founder of the artist group Material Exchange active in Chicago until 2009, in which she worked closely with artists John Preus and David Wolf and briefly with artists Charles Hassrick and Alta Buden. She continued to work with co-founder John Preus through 2010. Sara is currently working with artist Jillian Soto under the collaborative name Fielding. She is also currently working on a design build project with artist and architect Charlie Vinz, artist Rod Northcutt, and Jillian Soto. 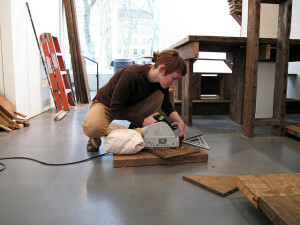 Her artworks use carpentry, wood-working, and repair as a time-based method, inherited wood or other haunted objects as a material, and imagine building as a physical means of articulating lived relationships in a constant state of renegotiation. 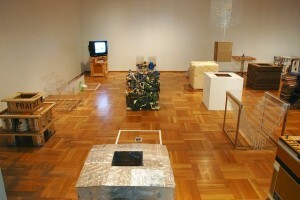 Sara Black received her MFA from the University of Chicago in 2006. She recently relocated to Yellow Springs, Ohio to lead the revitalization of the visual art program at the newly re-opened Antioch College as an Assistant Professor of Studio Art. She previously worked as an artist teacher in sculpture, installation art, and performance at the School of the Art Institute of Chicago and Northwestern University. Sara has also taught sculpture at the Ox-bow School of Art; drawing at South Suburban College; coordinated and led an arts apprenticeship workshop at the nonprofit Street-Level Youth Media in Chicago; served as a member of the visual arts faculty at the Gary Comer Youth Center; and taught 3-D visual language and experimental design at the University of Chicago and the Illinois Institute of Technology, respectively. Additionally, Sara was a co-founder and owner of a social center and cafe at the Experimental Station in Chicago, called Backstory.